Interested in becoming a member in an organization that does incredible work around the world? Zonta International is an organization for professionals and executives who come together for the common purpose of Advancing the Status of Women Worldwide. If you are interested in membership, please contact us by writing to laramiezonta@nullgmail.com. A representative of the membership committee will be in contact with you soon! Friday, February 16, 2018: Our next membership social will take place on Friday, February 16th and will be a free yoga event at Blossom Yoga, coupled with a discussion about the Red Sand Project and human trafficking. Donations will be accepted and proceeds will be sent on behalf of our club to Zonta International in support of the international service project on human trafficking in Nepal. September 19, 2017: Fall membership social with speaker Diana Laws from the Northeast Colorado Coalition Against Trafficking (NECCAT) will provide current information about human trafficking along the Front Range. 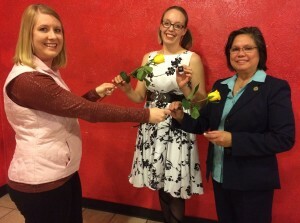 Diana is also a member of the Zonta Club of Greeley (Flyer: Learn more about how to stop human trafficking). February 1, 2017: Spring membership social at 8 Bytes Game Cafe.